Last Friday for the first time in quite awhile, I took the NY Waterways ferry from Port Liberte to Pier 11. When I got to the terminal one of the crew members told me that I could now buy my ticket on my Iphone. After downloading the App and completing a short signup process, I was able to purchase my ticket. In addition to purchasing and activating tickets (just show the crew the screen after activating) there are multiple ticket purchase options as well as schedules, route maps and other information all easily available. There are both Iphone and Android versions of the app available for download. 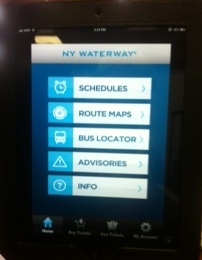 For more information visit the NY Waterways website at http://www.nywaterway.com/MobileAppDownloads.aspx.